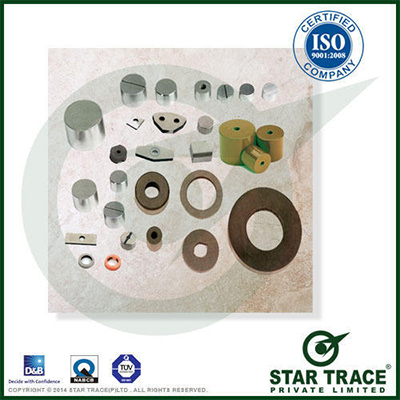 Alnico Magnets Producers, Cast Alnico, Sintered Alnico Magnets Suppliers: Star Trace Pvt. Ltd.
Star Trace Alnico magnets are made primarily from aluminium, nickel, cobalt, copper, iron and sometimes titanium. They can be either cast or sintered. Cast Alnico melted and poured into a mold. Once solidified, the material is rough ground and then heat-treated and cooled, sometimes in a magnetic field. When treated in the presence of a magnetic field, the magnet is called anisotropic. This orients the material to take on maximum magnetization and allows a higher gauss level. A cast magnet that is not heat-treated in a magnetic field is called Isotropic. After heat treatment and cooling, the material can be ground to specific tolerances and then magnetized. Magnetos, Separators, sensors, electron tubes, traveling wave tubes, radar, holding magnets, coin acceptors, clutches and bearings, motors, distributors, relays, controls, generators, receivers, telephones, microphones, bell ringers, guitar pickups, loudspeakers, security systems, cow magnets. Magnetizing is done after the magnet has been machined to the correct tolerances. Care should be taken when handling alnico material since it is brittle and chip or break if dropped on a hard surface. Also, because it has a low resistance to demagnetization, it will lose power if it is stored improperly (poles repelling each other). For best results, store magnetized alnico so that pieces are attracting each other, or with a steel keeper. Alnico is a very hard and brittle material and does not lend itself to conventional machining. The STAR TRACE Employs Experienced Machinists and the proper equipment to grind alnico to its require Ship.